N Korea blames Obama for net outage Jump to media player North Korea blames the US for a second internet outage in the wake of the hacking of Sony Pictures and a film featuring a fictional plot to kill Kim Jong-un. Obama: Sony hack 'cyber-vandalism' Jump to media player US President Barack Obama accuses North Korea of committing an act of "cyber-vandalism" over the hacking of Sony Pictures. FBI blames N Korea for Sony cyber hack Jump to media player The FBI has formally accused North Korea of launching a cyber attack against Sony Pictures. US filmgoers queue to see Sony film Jump to media player Audiences have queued to see The Interview, the film said to have triggered Sony email hacks. N Korea insults Obama over web row Jump to media player North Korea has launched another fierce attack on President Obama and accused the US of shutting down the country's internet amid the row about the release of The Interview and the hacking of Sony. N Korea denies Sony film hack claim Jump to media player North Korea denies hacking into the computer system at Sony Pictures in retaliation for a film depicting the country's leader - but praised the attack itself. North Korea has blamed the US for a second internet outage in the country in the wake of a row over the hacking of Sony Pictures and a film featuring a fictional plot to kill Kim Jong-un. 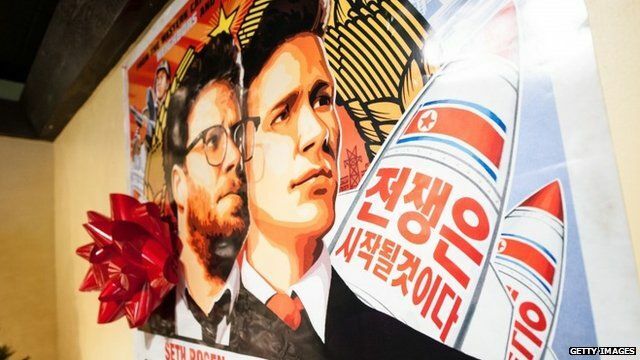 The Interview was originally pulled after a cyber-attack and threats - a move criticised by US President Barack Obama - but Sony later reconsidered and released it on 25 December. North Korea 's National Defence Commission (NDC) condemned Mr Obama for the release of the film, The Interview, describing him as "reckless" and "a monkey". World affairs correspondent Caroline Hawley reports.